No, Andrea didn’t go on another killing spree and Diablo Rojo is not a South American red wine. 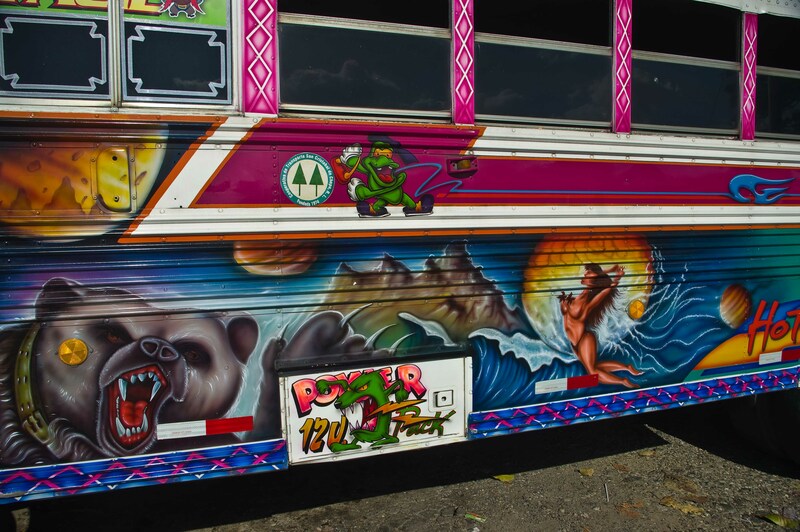 This is a piece on Panama City transit that may not seem to be a fascinating thing but I believe you may find some bits that capture your interest. 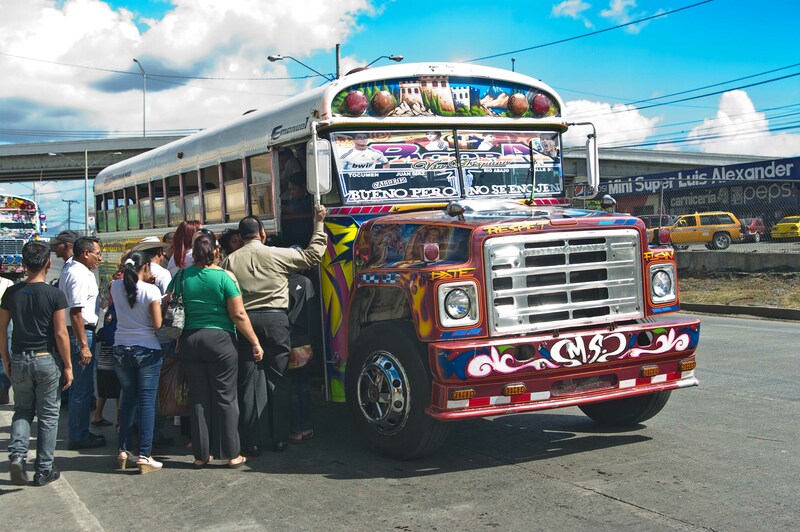 People here in Panama City have complained about their transit system, or lack of it, for years and fixing the problem was one of the platforms in President Martinelli’s election four years ago. Transit in the City has evolved over the years, as in most places, but it was deemed to be so broken that it was necessary to replace it and not fix the old system. 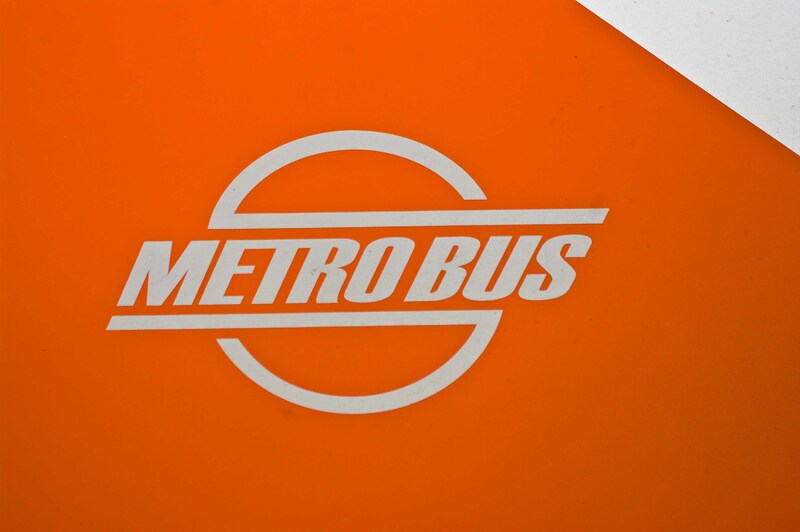 Today’s feature image carries both an old Diablo Rojo bus and a new Metro Bus. I have to admit that I like the Diablo Rojo best for its individuality, color and character. The old bus system was structured similar to our taxi commissions at home. 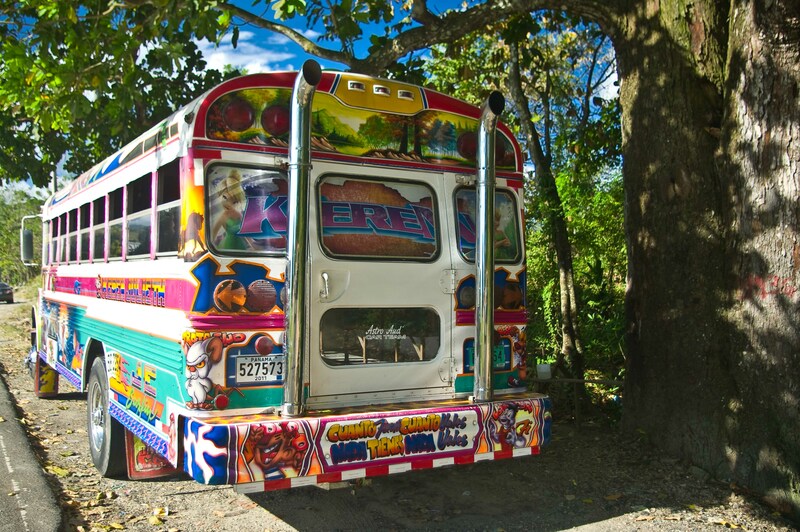 Individuals would get a license from the government to run a bus on a particular route. 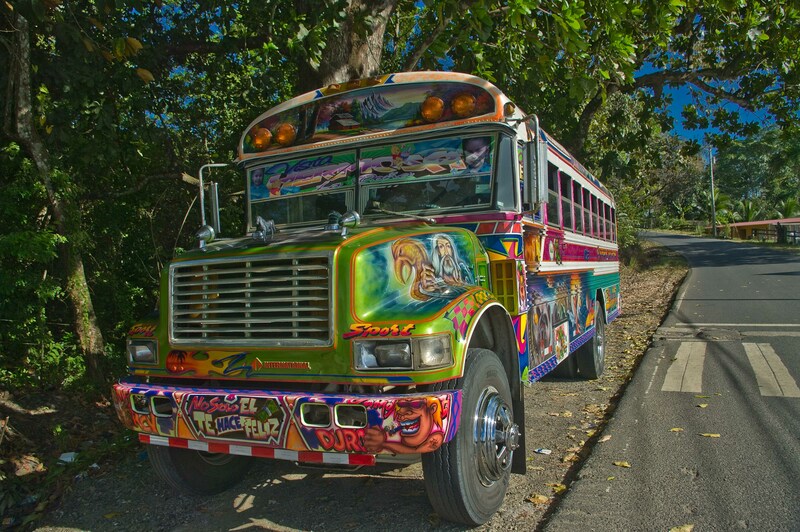 In some cases they would get a license for several buses and hire drivers for them. 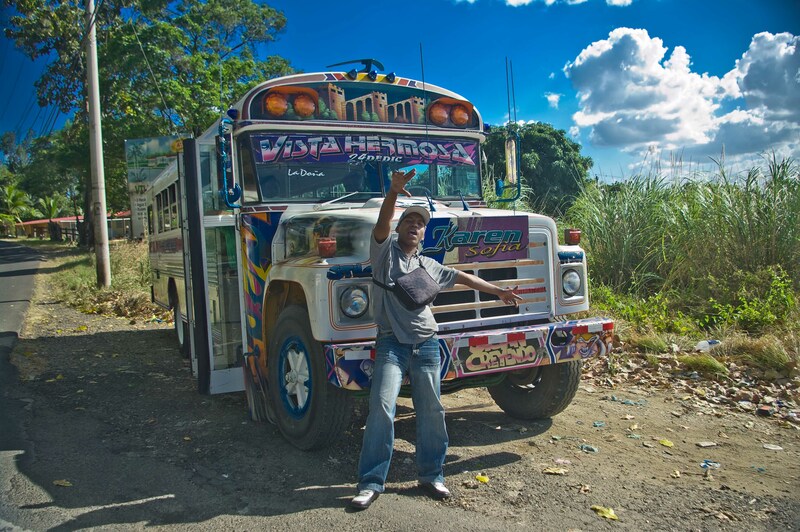 Some would hire drivers who owned their own bus and others would buy busses and hire drivers. All of the busses required a staff of two to run. One to drive and the other to take the money and to jump out at each stop, yelling the destination of the bus and herd as many passengers onto the bus in as little time as possible. You see, drivers were paid by the number of fares they obtained. Fares were a flat $0.25 each way, no matter how far you travelled. 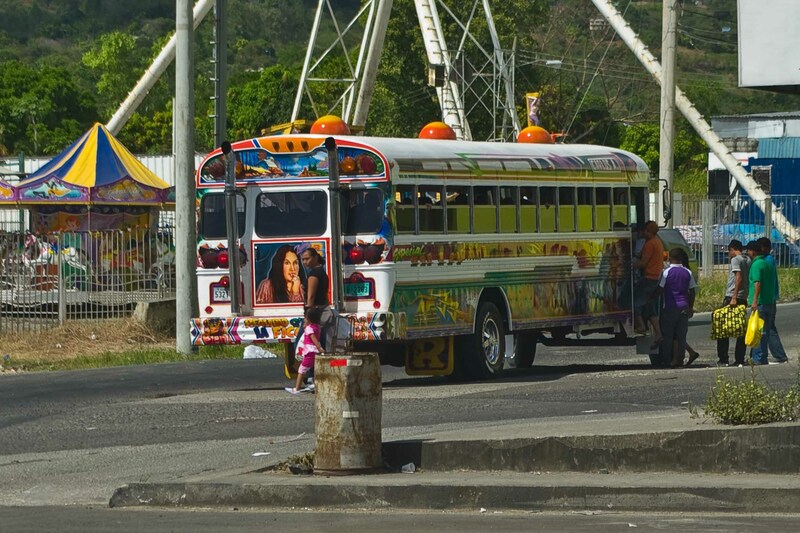 This caused fierce competition among busses to scoop as many fares as possible and, of course, made it necessary to drive as fast through the traffic as possible to get the next group of fares at the next stop before the other buses got them. 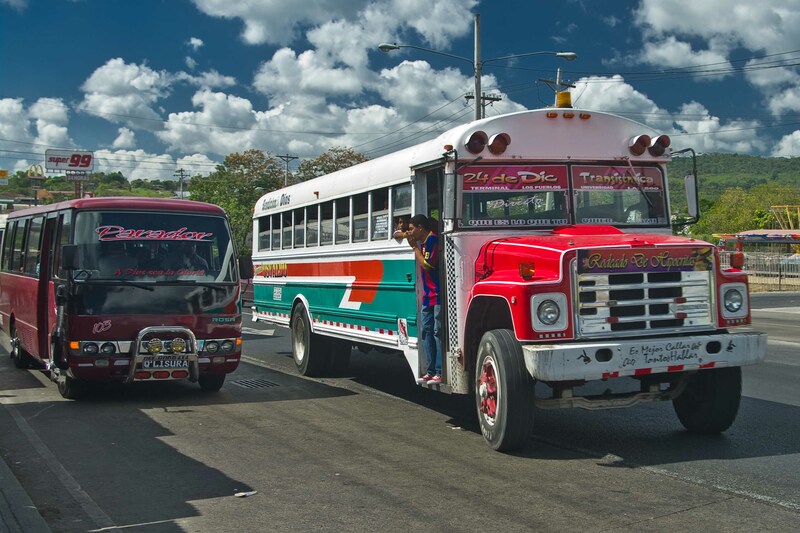 Busses became known as Diablo Rojo (pronounce Diablo Ro-ho)(red devils) by the locals not because they are red, few are, but because of the way they rocketed recklessly through traffic on their rush to their next stop. They used their size to intimidate all other traffic, on the way to scoop as many fares as possible from the next stop. Now with all of this bad in the system, you can see why something had to be done. 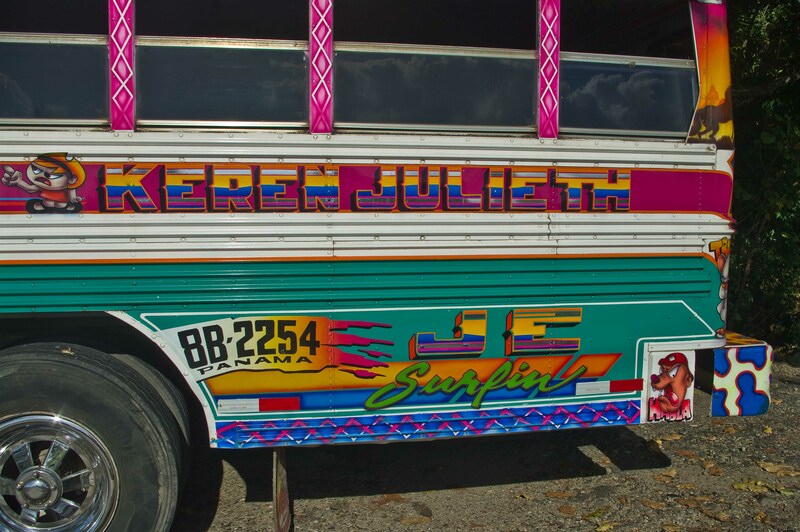 The safety issue alone has been claimed to be enough grounds to change the system but yet there is a sadness to the passing of the old Diablo Rojo because it is the passing of an era. 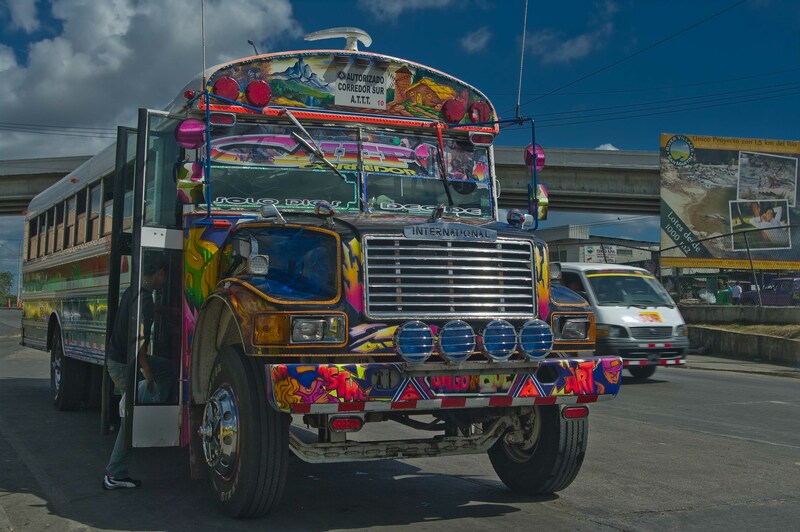 The beauty of the totally unique appearance of each bus as an art form will morph into a sanitized orderly modern transit system with each bus identical to the next. 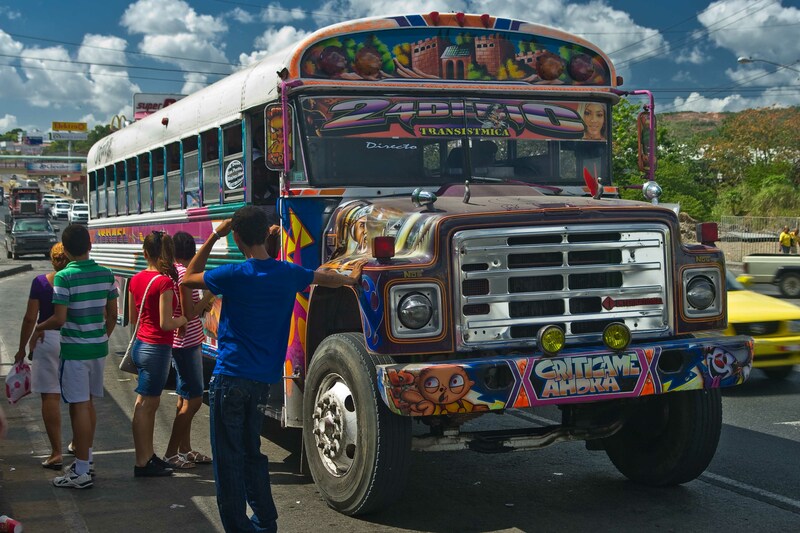 As these old retreaded Florida school busses roar into history, sadly one of the icons of Panama City will disappear along with a form of art that is unusual and colorful. 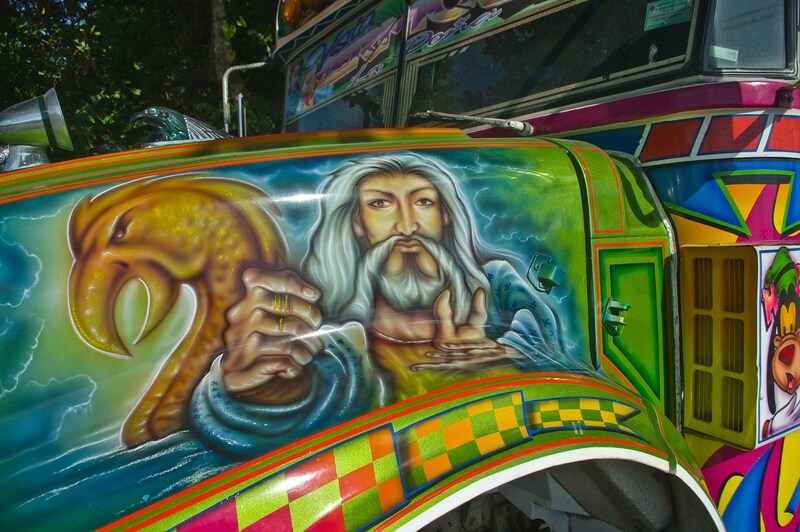 Where else can you see a portrait of Osama bin Laden etched on the side of a bus stuffed with people barreling through traffic? 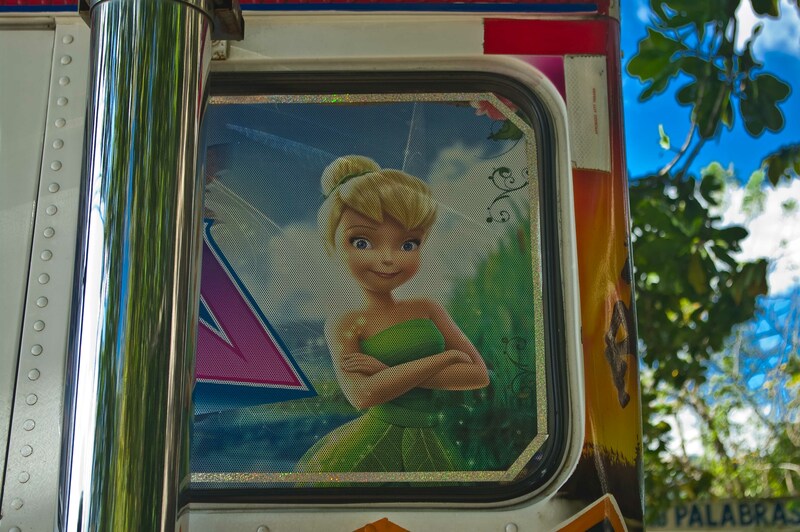 Each bus has been individually decorated to varying extremes. No two are the same! 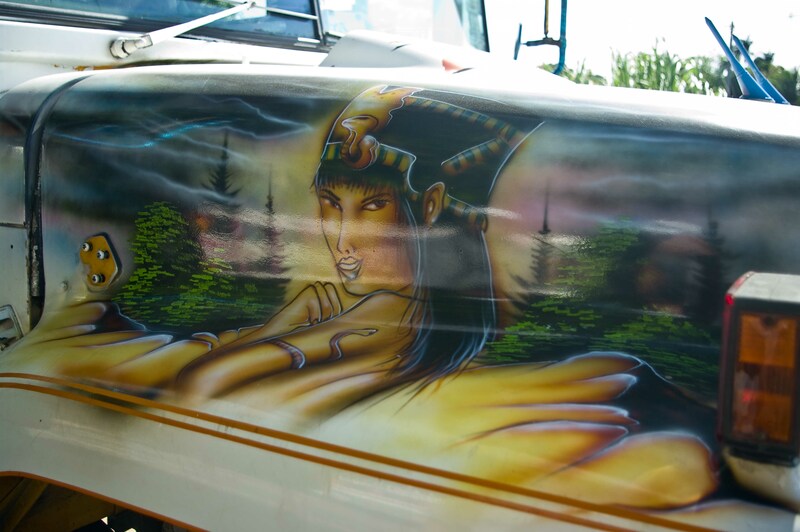 The hood is typically covered with as much chrome as it will bear and beautiful air brushed images of heroes or villains that hold some significance to the driver or owner. 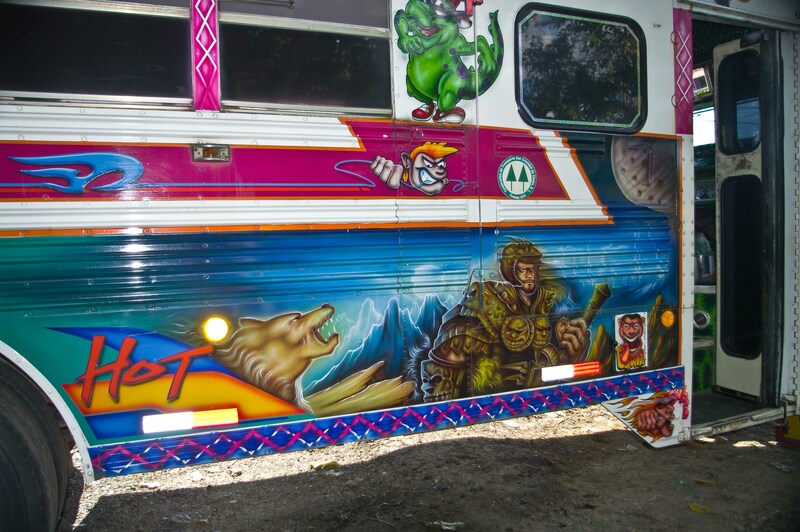 There is often a display of art on the sides of the bus and, of course, more decoration on the back. 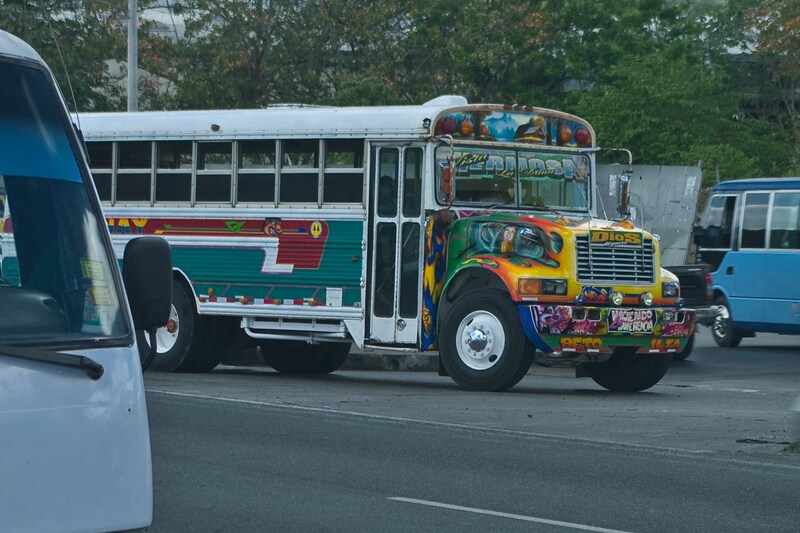 These diesel buses are purposely made as noisy as possible with the removal of any muffling devices and the addition of two four-inch chrome straight pipes up the back of the bus to the roof. They have been called a major contributor to the pollution of the City. You can hear them coming from blocks away! Many have been equipped with strobe lights to make sure people can see them coming at night. 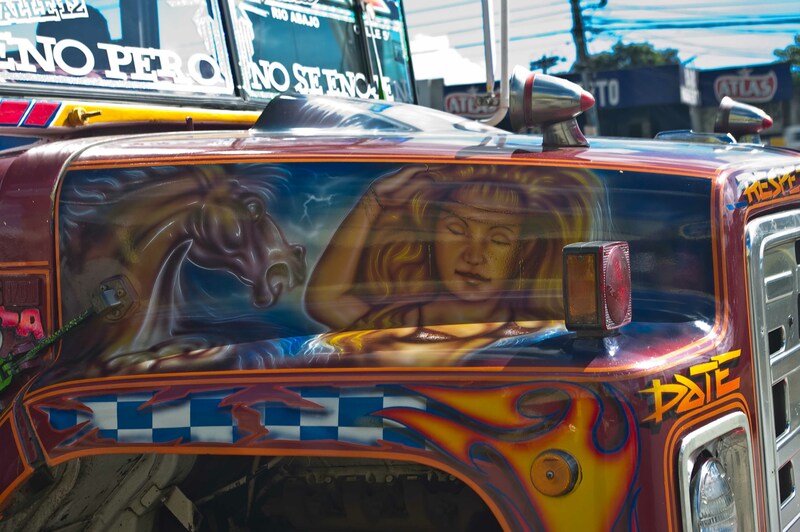 Here are a few examples of the art of the Diablo Rojo. I’m sure you can see the beauty of these aging relics just as I can. I found a couple of great examples at the end of their route and the drivers insisted on my taking pictures of their buses. 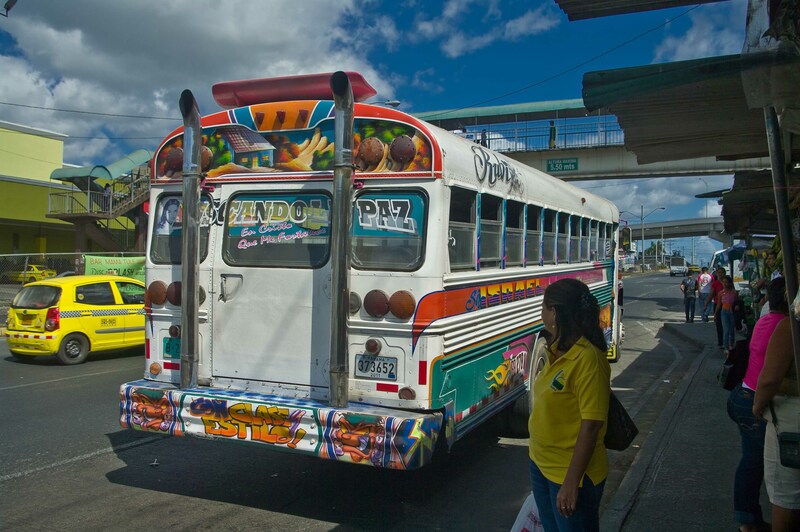 The Panamanian government put the new transit system out to bid to private companies. The successful bidder and new operator has implemented a zone fare system that basically lets you ride for around two hours on a single zone fare. Fares to the transit company are now at $0.47 but the government subsidizes those fares (after some public protest) so the ridership continues to pay the same $0.25. Now there are transfer privileges which did not exist under the old system and all the buses are air-conditioned. Implementation of the new Metro Bus system is being done on a route by route basis. Many of the major routes have been converted but the system has not yet been completed. It is a work in progress. 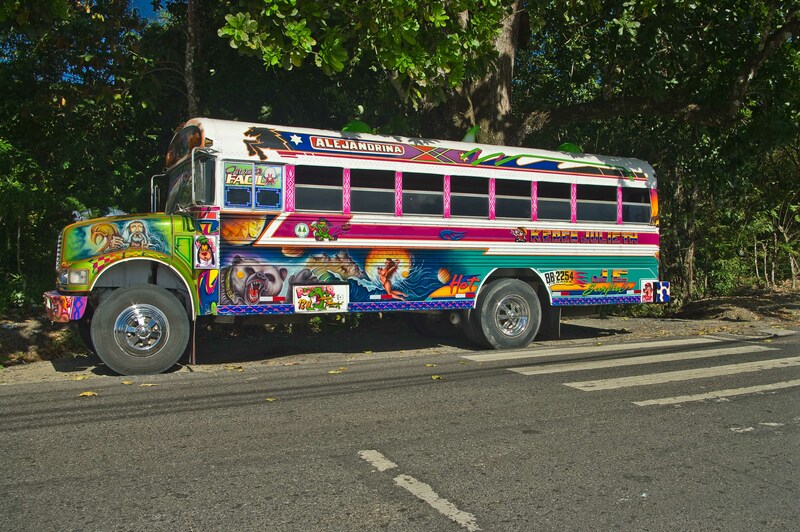 As the new air-conditioned Volvo buses become available, the government buys each of the old Diablo Rojo licenses and vehicles back from the license holder for $25K and parks the old buses in a large yard at Playa Bonita. Many of the drivers of the old buses have been retrained and are now driving the new buses and working on an hourly basis. It’s amazing to see how that simple change has affected the way buses negotiate traffic. 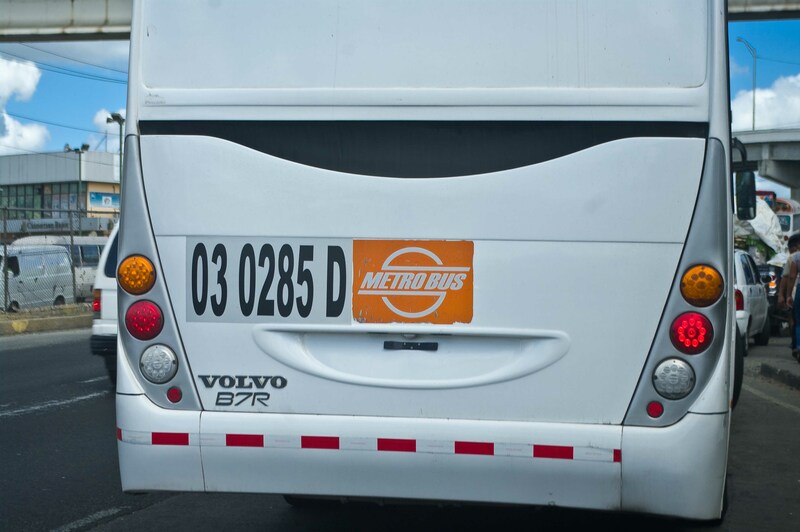 We passed a Metro Bus today that was patiently waiting with turn signals on to enter the traffic flow. The driver was wearing a neat uniform and wearing a seatbelt, all things that would never have happened under the old system! Another platform from the Presidential election was the construction of a subway system here. Although not yet open, it is well under way with two boring machines called TBM “Martha” and TBM “Carolina” both working. So the face of transit in Panama City is being sanitized to look like the transit system in any other North American city and although passengers have gained air-conditioned comfort and transfer privileges, I’m sure there are those that will miss the roar of the straight pipes and the adrenalin rush of rocketing down the road in a cloud of black diesel smoke on the hot stuffy Diablo Rojo. 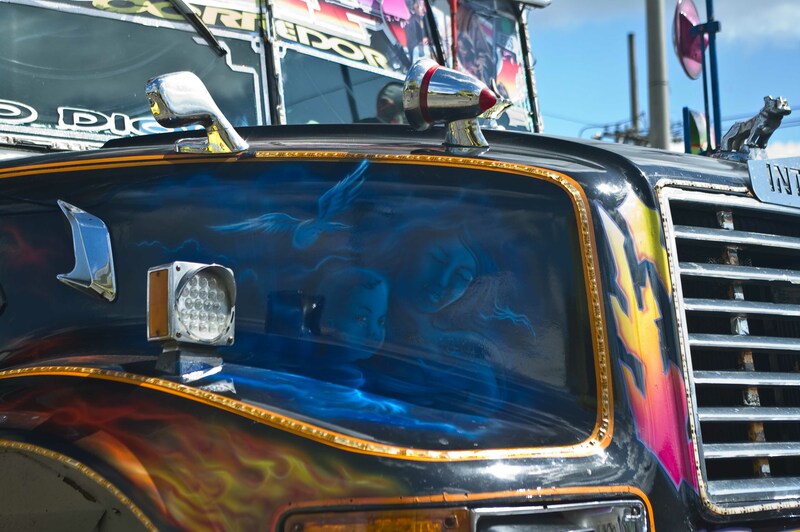 I’m sure there are others who will miss the Diablo Rojo as an art form. 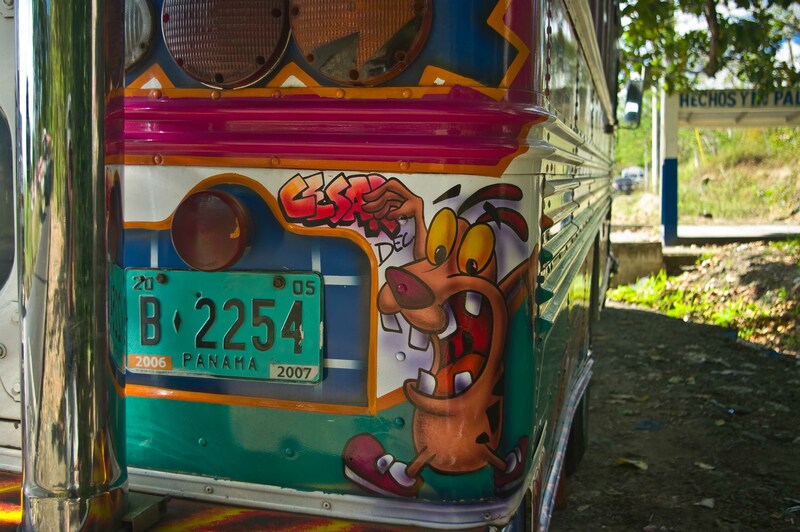 I share your sadness in the passing of the old Diablo Rojo, but hope some of them will be kept in a museum. Thankfully, some of the old vehicles have been preserved in cities such as Vancouver, Calgary, Edmonton, etc. 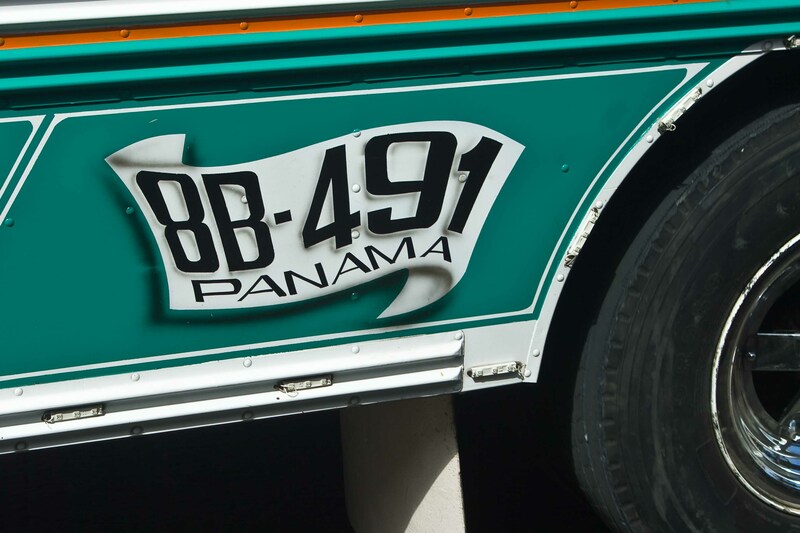 The renewal of the Panama transit system mirrors Vancouver transit history such as the outlawing of jitneys that competed with the early streetcars, going from 2 to 1 man streetcars, training streetcar drivers to drive trolley buses, etc. 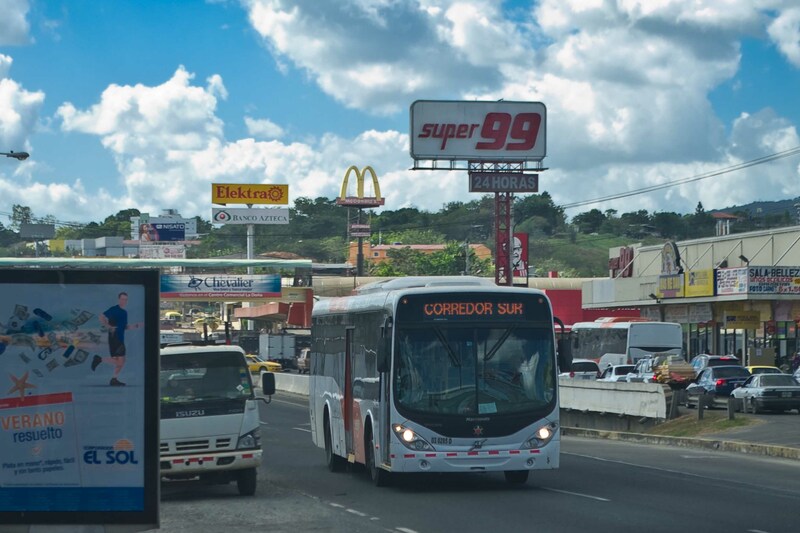 Panama City density makes building a subway sensible. Having a fleet of old used buses nearing replacement, and probable ridership increases resulting from bus/subway integration, probably created the right timing for the new Metro Bus system. More bus capacity will probably be needed. Are the new buses clean diesel, natural gas or hybrid technology? From our past discussions we have had on transit, I feel gratified to have helped stimulate your interest in doing this transit blog. Thanks for a good blog. If you were staying at the new Westin at Playa Bonita, you could look out the windows facing away from the beach and see a huge area where the Diablo Rojo’s that have been purchased by the Government are stored. You and I might appreciate it but I’m not sure about the guests at the Westin. I would love to get into that yard with my camera but there is a small matter of a barbed wire fence to deal with. Although the change does come with some advantages, I, too see the passing of the unique Diablo Rojos as having its downside. Great photos, Keith, and very informative and detailed article. Thanks Phil, it was fun to research and write!